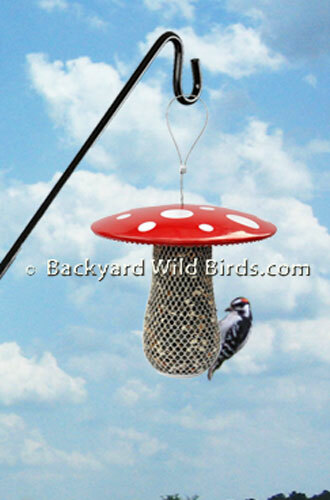 The Sunflower Mushroom Bird Feeder is an all metal Sunflower Bird Feeder. The Mushroom wire mesh feeder has a nice 8.5" weather baffle above to keep the seed dry. 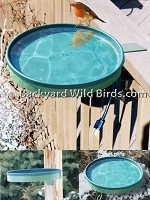 The metal wire mesh is just the right size for Sunflower bird seed. But can also be filled with peanuts, or suet. Powder coated, all metal finish with easy twist off lid. The feeder has a 0.70 lb. seed capacity. 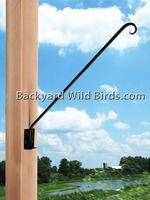 Squirrels can get on the feeder but they have difficulty getting alot of seed through the wire mesh. This why it can work well on deck poles. Sunflower seed is the favorite of a great variety of songbirds with a Downy Woodpecker is shown here.